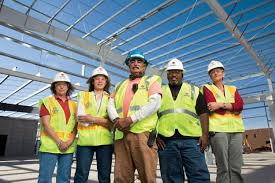 The goal of the Highway Construction Careers Training Program (HCCTP) is to increase the number of minorities, women and disadvantaged individuals working in the construction trades. •	Math curriculum will focus on the fundamental concepts of basic numeric skills, measurement and conversion, algebra and geometry. The math concepts will be supported with practical applications, on the job problem solving, and job related tasks through communication. •	The job readiness curriculum is designed to add to the overall success in a work environment. The workers of the future need skills that will allow them to communicate effectively with team members as well as adapt to a diverse workplace. •	The technical skills curriculum will allow students to practice the principles learned in the classroom portion of the program. This part of the program will include tool usage, blueprint reading, labor extensive community service projects throughout the community, and hands-on activities at various trade unions. Participating unions include: Laborers, Carpenters, Cement Masons, Electricians, Bricklayers, Sheet Metal Workers, Operating Engineers, Painters, Steamfitters, Sprinklerfitters and Plumbers. •	There are three class sessions per year (Fall, Winter, and Spring). •	Contact Monica Arbuckle for next class session. If selected for the program, the class will begin on February 18, 2019 and end on May 10, 2019. *Funded by IL Dept. of Transportation and administered by the IL Community College Board. The Illinois Department of Transportation, the Illinois Community College Board and the participating community colleges do not guarantee employment upon a trainees’ graduation from the Highway Construction Careers Training Program.